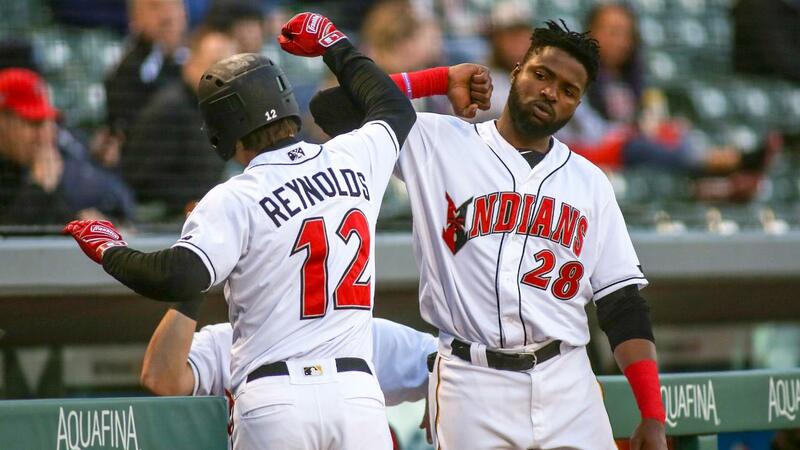 INDIANAPOLIS - Cole Tucker and Jake Elmore collected three hits apiece, JT Brubaker pitched into the sixth inning, and the Indians dumped Toledo 9-1 on Monday night. Bryan Reynolds drilled his fourth home run of the season in the win. The game was scoreless until the third inning, when a pair of one-out extra-base hits staked the Tribe to a 1-0 lead. Tucker tripled into the left-field corner and scored moments later on an Elias Diaz double to left-center. Indianapolis (7-4) sent seven batters to the plate its next time up. Reynolds' solo homer doubled the lead and Elmore brought home two more with a two-bagger to right-center. Brubaker cruised along with the 4-0 advantage, but he exited the game with one away in the sixth inning with an apparent arm injury. Despite the shortened start, Brubaker (W, 2-0) held the Mud Hens to four hits while striking out five over 5.1 innings pitched. The Tribe offense piled on five more runs before the finish. Infield singles by Elmore and Tucker and a walk to Diaz set up a two-run single by Gregory Polanco. Will Craig then pounded a two-RBI double to left to make it 8-0. Tucker added a run-scoring double of his own in the eighth to cap Indy's output. Toledo (5-6) avoided the shutout thanks to a Harold Castro RBI double in the ninth. Ryan Carpenter (L, 0-2) was tagged for six earned runs on seven hits over 6.0-plus innings pitched. The Indians and Mud Hens continue their four-game set with an 11:05 a.m start on Tuesday. Righty Mitch Keller (0-0, 5.19) will oppose Toledo right-hander Beau Burrows (0-0, 0.00).